First developed by the University of Queensland in 2008, the Three Minute Thesis competition (3MT®) challenges research students to communicate the significance of their projects to a non-specialist audience in just three minutes. 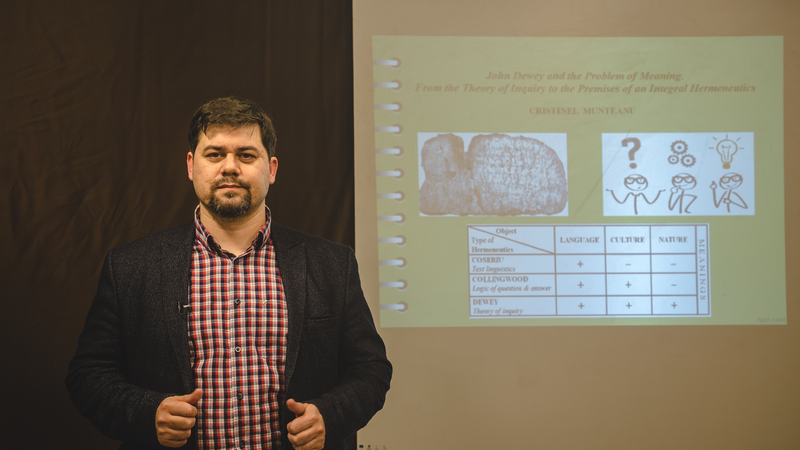 The winner of the 3MT University finals held at “Alexandru Ioan Cuza University” of Iași on 9.03.2018 is Mr. Cristinel Munteanu, from the Doctoral School of Philosophy and Social-Political Sciences, with a research entitled JOHN DEWEY AND THE PROBLEM OF MEANING. FROM THE THEORY OF INQUIRY TO THE PREMISES OF AN INTEGRAL HERMENEUTICS. The winner of the 3MT University finals held at Alexandru Ioan Cuza University of Iași on 10.03.2017 is Mrs. Elena Sabina Hodor (married Turnea), from the Doctoral School of Economics and Business Administration, with a research entitled CONTRIBUTIONS TO THE DEVELOPMENT OF A TOTAL REWARD MODEL FOR ORGANIZATIONAL PRACTICE.